It’s been a little over five years since I accepted a position as archivist at Cranbrook Archives. I had toured the Archives some years before, when I first became photo archivist in the Burton Historical Collection of the Detroit Public Library. Though familiar with Cranbrook from growing up in the area, I thought, boy, this would be a cool place to work. My wishful thinking turned into reality when, after retiring from Detroit Public Library and working as a volunteer in Cranbrook Archives, a position opened up. Lucky me! And my first assignment was to process the papers of Edward and Ruth Adler Schnee. I had shopped in their iconic store in Harmonie Park and was delighted to meet Ruth and hear all about her fascinating life, which gave me a framework for processing her papers. Ruth Adler Schnee in a fun moment. Meeting Ruth was just the beginning of a deep plunge into subjects of which I was only marginally aware: the George Gough Booth family who founded Cranbrook; the Saarinens who designed its campus, many of its buildings and furnishings; artists such as Harry Bertoia, Marianne Strengell, Katherine McEwen, Charles & Ray Eames, Maija Grotell, Harry Weese. My head was spinning trying to keep up! Gradually I became familiar with the history of Cranbrook as documented by the rich material in the Cranbrook Archives. The manuscript collection (institutional and individual), the photograph collection, the architectural drawings, and the myriad other informational sources, not to mention my coworkers, other Cranbrook staff, and Archives’ volunteers, all helped fill in the blanks. Most of all, head archivist Leslie S. Edwards, guided me through the intricacies of building names and campus personalities, filling me in on strange anomalies such as Chanticleer Cottage, or some of the unheralded people like the Vettraino family or John Buckberrough who, in small but important ways, helped make Cranbrook what it is today. A favorite view when eating outside in the summer! If you haven’t guessed by now, I’m moving on to other adventures; today is my last day. I learned so much here, thanks to everyone I worked with. And it turns out I was right. Cranbrook is a cool place to work! Ok, so I have to admit, I had no idea what the term “phenomenological” meant until yesterday when the Archives was host to a group of architecture students from Lawrence Technological Institute. Phenomenology was defined by the German philosopher Edmund Husserl as the philosophical study of the structures of experience and consciousness. So how does this fit in with architecture? Well, the idea that we experience architecture with all of our senses does seem perfectly logical and of course Cranbrook is a perfect example of that. The two buildings the students focused on were the Cranbrook School Dining Hall and the Natatorium. If you have ever walked into either of those spaces, you can absolutely understand the phenomenological experience – the dining hall with its’ high vaulted ceilings, the Orrefors glass pendant light fixtures, and the 12 foot leaded glass windows that line the walls and throw patterns of light across the room – all of these contribute to both our visual and non-visual senses as we experience the space. Head Archivist, Leslie Edwards, discusses drawings with LTU students. The Natatorium illustrates this concept even more dynamically. The complex use of materials – glazed exterior and interior brick, concrete block interior walls, the gray stone pool deck, the hand-glazed tiles in the locker rooms, and the use of mahogany for the walls, railing, and vertical louver panels – all contribute to the total sensation of the space. Add to that the windows that look out to the woods and the ceiling oculi that open up to the sky and you definitely experience phenomenology. So thanks LTU students for teaching me something new when you came to the Archives to look at the architectural drawings. Days like this are another one of the perks of being a Cranbrook archivist. 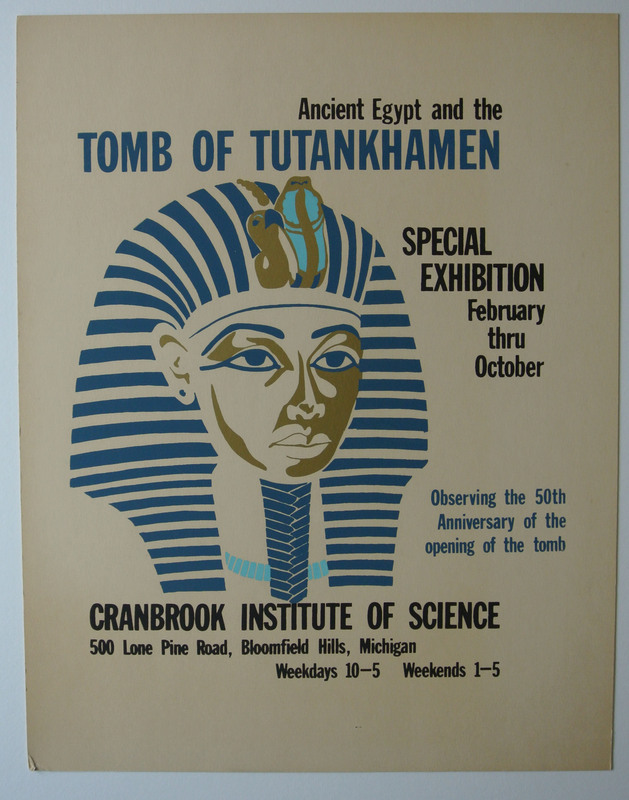 In the spring of 1927, Cranbrook founders George Gough and Ellen Scripps Booth traveled to Egypt. In addition to visiting Cairo and having their photograph taken after an hour long camelback ride, the Booths visited the tomb of the Egyptian Pharaoh, Tutankhamun (King Tut). 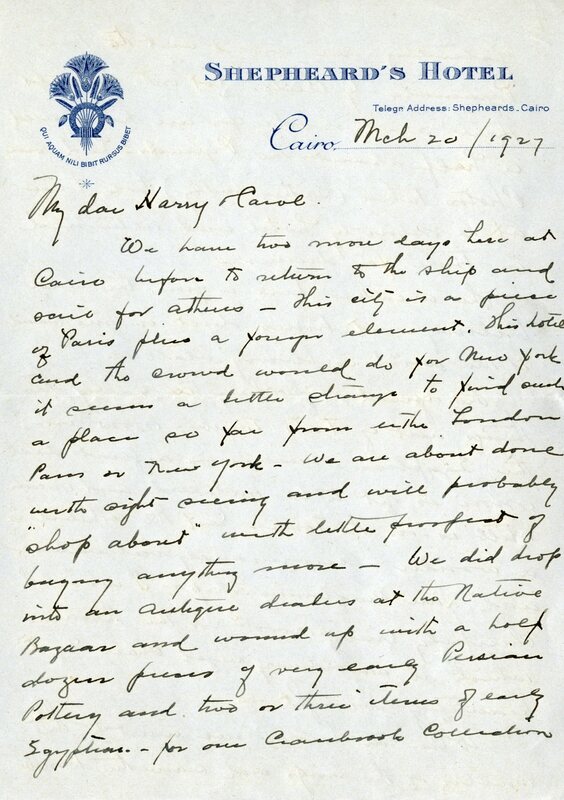 Letter from Cairo, Mar 1927. Replica created by Egyptian artisans and purchased by George Booth in 1927. The original chair is in the Egyptian Museum in Cairo. Photograph courtesy of Cranbrook Institute of Science. As the original chair was not for sale, Booth commissioned a replica to be made for the Art Museum collection. The chair, of carved wood with relief decorations covered in gold leaf, was later determined to be the chair of Sitamun, an Egyptian princess (and thought by many scholars to be the mother of King Tutankhamun). 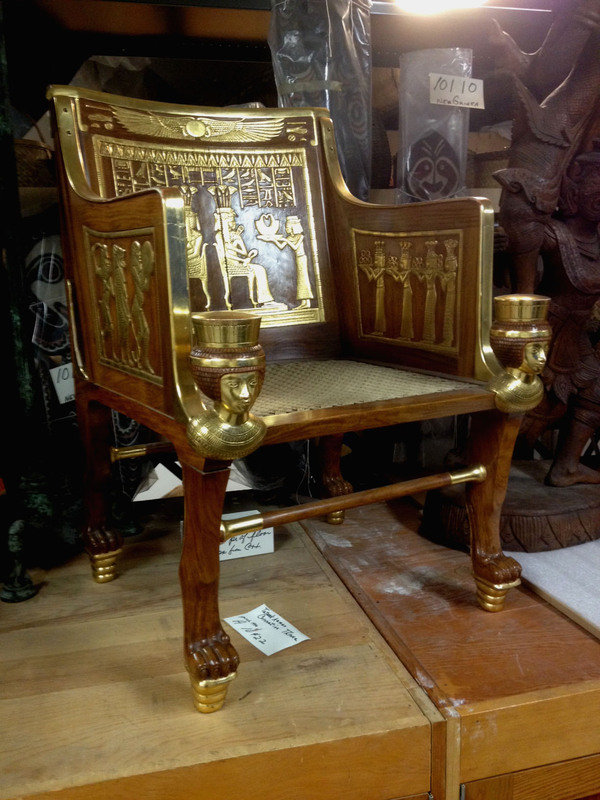 The chair was lent to the Institute of Science for a 1973 exhibition titled, “Ancient Egypt and the Tomb of Tutankhamen”. In 1984 the chair was transferred from the Art Museum to the Institute of Science, where it still resides today. Troubadour, poet, and composer Richard Dyer-Bennet (1913–1991) was among the best known and most respected folk singers in America during the 1940s and 1950s. He became the first solo folk musician to appear in Carnegie Hall and on December 7, 1941, NBC radio broadcast Richard Dyer-Bennet singing “The Ploughboy” when the broadcast was interrupted with the announcement of the attack on Pearl Harbor. 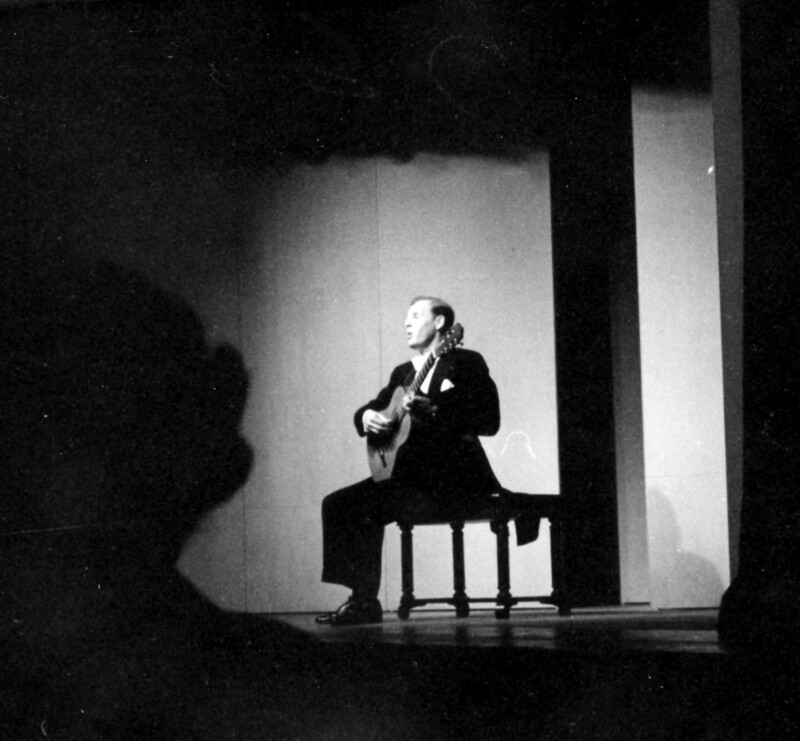 Richard Dyer-Bennet performs at Cranbrook, Feb 1954. Harvey Croze, photographer. Brought to Cranbrook by the Cranbrook Music Guild in February 1954, Dyer-Bennet presented “The Voice of Minstrelsy,” a program of traditional folk songs which spanned six centuries and included old-world European songs as well as American folk ballads. A year later, Dyer-Bennet founded his own record label in order to maintain artistic control over the sound quality, repertory, and style of his performances. To see the poster featured in this blog, as well as numerous others from our collection, visit the Archives’ exhibition Designs of the Times: 100 Years of Posters at Cranbrook.